One of the most critical and challenging exercises in developing a sound strategy is trying to accurately anticipate the future. There are so many variables and moving parts! Many argue that trying to predict the future is pointless and a waste of time. However, there are those that somehow can see key trends, capitalize upon them, and become major players in building the future. Every four years,the National Intelligence Council (NIC) facilitates the development of a "Global Trends" report. The reports are used by the White House, Intelligence Community, and others for planning purposes. In creating the report, NIC conducts a multitude of conferences, workshops and individual meetings with scholars, experts, universities, think tanks, science labs, businesses and government institutions from around the world in an effort to accurately detect and anticipate future trends. The world of 2030 will be radically transformed from our world today. Many wonder if the US, China or if some other large country will be the dominate player in the future. NIC doesn't envision one predominant nation that will influence the world by 2030. They surmise that greater empowerment will naturally evolve throughout the world. Individuals, states and informal networks will have more influence and large national governments will wield less influence. As the graph shows below, it took Britain 155 years to double GDP per capita. It took US around 50 years to double its GDP per capita. Look at China and India! 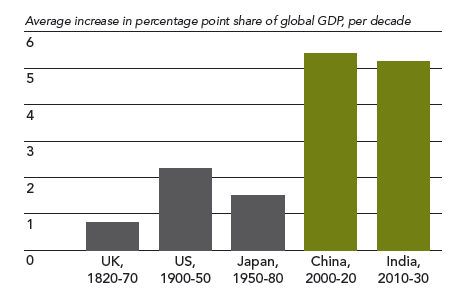 China and India increased their GDP per capita by over 500 fold in 20 years. Here is what is exciting. China and India have 100 times more people than Britain. The NIC believes that by 2030, most people on the globe will be within the middle-class. Individual empowerment will accelerate substantially during the next 20 years owing to poverty reduction and the huge growth of the middle class, greater educational attainment, and better health care. NICs also sees widespread adoption of communication and manufacturing technologies. There will be a high demand for consumer goods. With broader access and improved communications technology, people would be better informed, better able to connect with networks and together grow in their ability to influence the governments where they reside. Education will be key to an expanding middle class. Economic growth depends upon on education levels. Women throughout much of the world are steadily narrowing the gap with men in years of formal education. Emerging technologies such a wireless communications and smartphones are empowering people everywhere - and without the huge investment costs that were required just decades ago to build expansive communications infrastructures. By 2030 health-care will have improved. Infant and child mortality rates will have decreased. People will live longer and the quality of life will be improved. It is natural to assume that a rise in income would led to great democracy. Historically, however, too often a rise of the middle-class has led to populism and dictatorship. Populism is a political philosophy that advocates power of the people in their struggle against the privileged elite. Populism can easy transform itself into dictatorial governments. Rising expectations have historically been a powerful driver of political turmoil. Once a high enough GDP per capita income is reached, however, the risk of authoritarian regime inserting itself is reduced. As the world become more global and less boundary constrained, people with differing cultural, ideological, political, educational, and religious views will need to come and work together. This will have its challenges. Individuals and small groups will have greater access to lethal technologies, making is possible for them to instigate large-scale violence and destruction.